← Springs, shoots and leaves. This picture was taken in 1933, in the depths of the “Great Depression” which lasted from 1929 to 1939. The hardest-hit cities in Canada were in the heavy industry centers of western Ontario. In Windsor unemployment had skyrocketed to almost 45%! So who were these well-fed men in top hats and don’t you think they might have felt a tad embarrassed parading around in top hats, spats, white gloves and canes when there were tens of thousands of their fellow Windsorites surviving on bread lines and soup kitchens? And who were those extremely earnest looking boys in pillbox hats from St. Marks Church’s Boys Brigade? This surreal clipping was provided by a reader several years ago with no accompanying information other than the caption and writing above the photo. Lo and behold, the Boys’ Brigade (BB) still exists. It is an interdenominational Christian youth organisation, created in 1883 by some Scottish fellow named William Alexander Smith “to combine drill and fun activities with Christian values.” It became a worldwide organisation by the early 1890s and in 2003, there were 500,000 Boys’ Brigade members in 60 countries. Initially, a simple rosette was worn as an identifying uniform, then replaced by a belt, haversack and pillbox cap (a popular military cap of the day) worn over the boys’ everyday clothing. The pillbox cap was used into the 1960s. The movement also pioneered camping for leisure in Britain, previously rarely used outside the military. I could not find out when the Boys Brigade was discontinued in Windsor but I have a hunch it may have been replaced by the Boy Scouts. And who knows where all those pillbox caps ended up, not to mention the shiny top hats. Here’s where I got my info and where you can learn more, if you so desire here and here. At noon people started making their way down Parent Avenue singly, in twos and threes and in larger groups. It was a good three-mile hike to the track so any adults willing to walk that far had to have betting blood in their veins. This entry was posted in Fashion, People, Windsor Now, Windsor Then and tagged 1933, 45% unemployment, bets, betting, boy scouts, Boys Brigade, bread lines, camping, Canada, canes, children, Christian, desperate, Devonshire, global, Great Depression, horses, hot dogs, hungry, inspection, Kenilworth, Kennedy Collegiate, military, nags, obedience, Parent Avenue, pillbox caps, races, racetrack, Scotland, slips, soup kitchens, surreal, top hats, track, values, welfare, white gloves. Bookmark the permalink. I too applaud Elaine Week’s efforts. I was born in Windsor in 1951 and graduated from Hugh Beaton P.S., Walkerville Collegiate Institute and the University of Windsor. I moved to Ottawa in 1974, where I remain. I have Elaine’s many publications and treasure them. As to the photo, I suspect that it is what it purports. Walkerville high school had a cadet corp when I was there (1964-1969). It shortly died. Other schools had therm too and I suspect this is Kennedy’s forerunner in the years between wars. I would not be hard on the men with top hats. The photo seems to be on a soccer pitch (see corner kick chalk markings). This smacks of a formal inspection (an annual formal event). 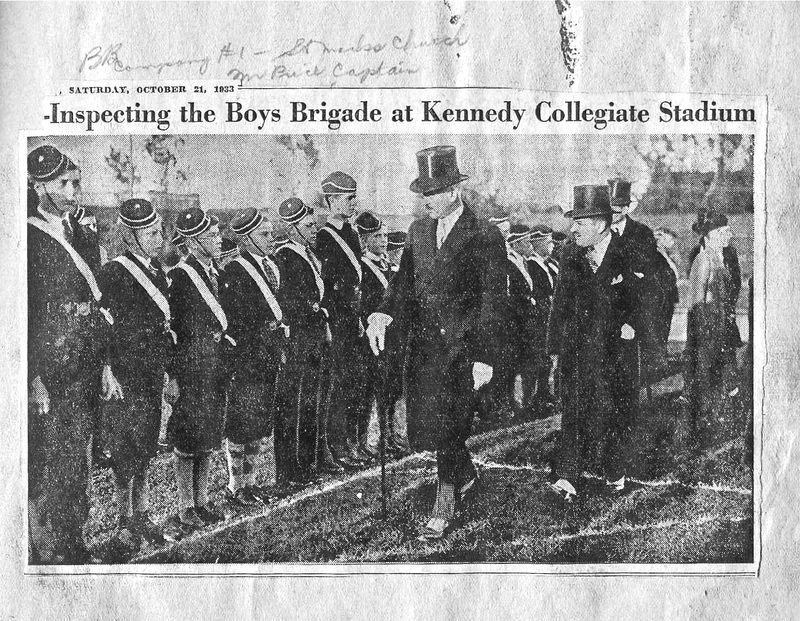 The men in top hats were, undoubtedly, in ceremonial garb, as were the cadets. They were maybe the Principal and Vice-Principal. Probably not a sign of arrogance. Elaine, I really enjoy your blog. I’m glad you decided to write again, and the blog is perfect. I like your writing style, too…very casual yet informative…makes reading easy and interesting. And I love the information you provide on Windsor past. Thank you…looking forward to more! Thanks so much Cris! I’m glad your’e enjoying. I think that history is a lot more fun than how it’s usually remembered.